Hi there, this is Dino Rachiele, owner and founder of Rachiele, LLC. Thank you for visiting my website! I love what I do and I hope it shows. I look back at the 18 years I have been in business with a great deal of pride and humility. I am acutely aware that my success has not been mine alone. Many employees and family members have been a big part of the success of my company. For that, I am eternally grateful. I am also grateful to our past clients who take time to email and call regularly to tell us how pleased they are. You are seeing about 1/2 of my factory from this vantage point. As a side note, the American Flag was the first thing we set up. We are proud to be manufacturing in the USA. Prior to 1997, I was a full time kitchen designer. I designed luxury kitchens, specializing in ergonomic and timeless design. In late1997 I discovered the Internet and began selling cabinetry online. That ended up becoming my full time job. I started a company called Luxury Home Products in late 1997. I represented and sold everything from cabinetry to lighting fixtures, sinks, faucets and ceiling fans. The company (Luxury Home Products) became on of the largest of its kind online. In early 1998 decided to run my sink design ideas past some of the major sink manufacturers - as I found virtually all sinks on the market to be lacking in ergonomic design. Virtually everyone that I spoke to was uninterested. I then decided to patent some of my ideas. I was awarded quite a few patents. 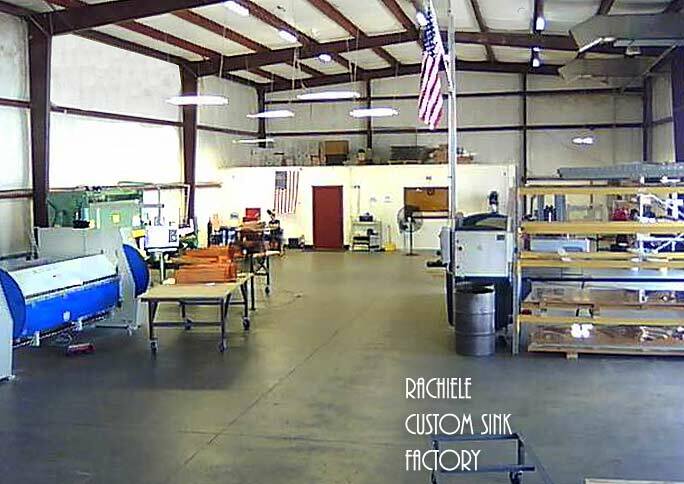 I started the Rachiele custom sink company in 1999. I started to get many requests from kitchen dealers so I set the company up to sell directly to dealers and we amassed over 140 dealers across the US and Canada. After almost a decade, my designs became so intricate and my options so diverse that it became difficult to pass that information through a dealer to the end user. In 2008 I decided it would be best to sell direct to the end user. All of our dealers, thankfully, understood and we parted ways as friends. Also in 2008 I decided to drop all imported products from my Luxury Home Products company and change the name to "The USA Home". I had countless problems with faucet manufacturers and constant daily warranty claims - all except Waterstone. That decision turned a 3 million dollar a year company (Luxury Home Products) into a half million dollar a year company overnight - now called The USA Home. I have no regrets. I do everything I can to insure every thing we use is Made in the USA unless there are no domestic options at all. All of our metal is made in the USA. Even the foam packing we use to when we crate the sinks is made in the USA. Our poly boards are made in the USA (that was quite a challenge. Most are made in China). We love our country and do what we can to support it. We are also very grateful to our Military and First Responders. The best part of all of this is I have not worked a day since 1998. What I do on a daily basis is fun for me. In fact, I was asked what my retirement plans were and I had never thought about retiring for quite some time. Once I thought about it, I realized, there was nothing I would rather do that what I do every day. We always look forward to December as our slowest month. That is a time when we can relax a bit and catch up on year-end tasks. Not last year. I did some quick math and discovered our sales were up by 292% of the previous December. Yikes! January was another record month. All of this without spending money on advertising. In fact, we stopped advertising about a decade ago. We are now fairly well known and most of our business comes from referrals from past clients, repeat business and referrals from architects and builders who have seen our work. For most companies, advertising is the biggest budget item for overhead other than payroll. Having no advertising budget expenses means we can run lean and mean and pass those savings on to you! We could not possibly be busier! Lead times are leaking well into Mid November and December. Almost all of our business is referral, or repeat business. For those reasons, we only spend a few hundred dollars a year advertising. There is no real need to advertise. My parents always said, "if you do a great job, people might just refer you to their friends. If you do a bad job, people will definitely go out of their way to tell their friends to stay away." You might see companies that have been in business a long time "price matching" or even "Will Beat all Prices". That is a sign that perhaps something is wrong. Those of us who know the scent of desperation, know what to do when we confront it. We are not ashamed of our prices and have never "price matched" for that reason. Our prices have always been the best we can offer and still give world class customer service and quality products. We have had more local business this summer than in all the years we have been in business. We have been fortunate that most of our business comes from referrals and repeat customers. The few seeds we have planted in Florida have grown. It has always amazed me that we have done so little in Florida compared to just about any other State. Well, that has changed! We have been quite busy lately. That being said, there is always time for innovation and testing. My NexGen design was recently rolled out. We thoroghly tested the design and made some alterations to the apron of the sink as well. The alteration offers even more ergonomic advantages than our prior design. We built the first NexGen Evolution sink. That was truly an engineering marvel. We are still working on tweaking the design a bit before we roll it out to the public. A belated Happy New Year to everyone. Last year was one for the record books. We are so grateful for all of the referral and repeat business. The vast majority of our business is generated that way. One of the wonderful values of owning a factory and having such a talented team is that we are constantly evolving our product offerings and even our basic designs. 90% of our sinks have new design improvements and more are coming very soon. Always blazing a path far ahead of the pack has been, and continues to be, a fun adventure. Many of you may not be aware, but I was the first to introduce a rear corner drain to the industry as a standard. Many of my friends in the industry have followed with that offering. The workstation sink was also my original design as well. Many companies have followed with their similar designs and I am flattered. It sure has been a long time since I updated this page! Whew, time flies when you are having fun - and fun it has been! We have been growing at a fast pace, however quite manageable. We have added workers in the factory and we have upgraded our apron front top coat finishing significantly this year. Theme park work in Orlando is around the corner. They have reached out to us due to a dissatisfaction of the workmanship they have been receiving lately and are very aware of our high quality standards and know some of our employees quite well from past work they have done. We are creeping up on our 200th sink made in the new factory since mid June and we have been able to easily keep up with production. Business is booming and we are so grateful for the wonderful employees that allow me to offer the best of the best to you! What a year we had! Sales soared beyond my wildest dreams. Our new factory has enabled us to produce a higher quality product while speeding up lead times. It is that time of year to be thankful and to pay it forward. This year we brought donuts and bagels for 50 fine Apopka Police department workers. We also left paid gift cards at the local Race Trac gas station and instructed the workers to use them for anything police officers would like during the holiday. We hope this inspires you to do a little something for those who do so much for us. We have a show for you courtesy of Elon Musk of Tesla.